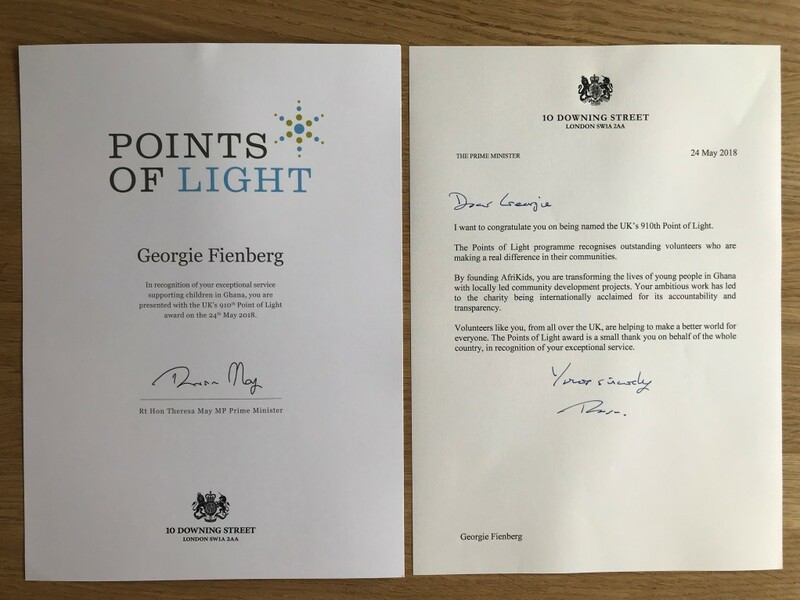 We are over the moon to announce that our founder, Georgie, has been recognised as a Point of Light by the Prime Minister! Today, Theresa May awarded Georgie with a Points of Light award for her incredible efforts to support disadvantaged children in Ghana over the last twenty years and for founding AfriKids. Georgie is the 910th person to be named a UK Point of Light, an award given to outstanding individual volunteers to highlight the positive changes they are making in the community. “By founding AfriKids, you are transforming the lives of young people in Ghana with locally led community development projects. Your ambitious work has led to the charity being internationally acclaimed for its accountability and transparency. You can read more about why Georgie was given this award on the Points of Light website here. Congratulations Georgie - as our team in Ghana would say, this award will give us more grease to our elbows! !